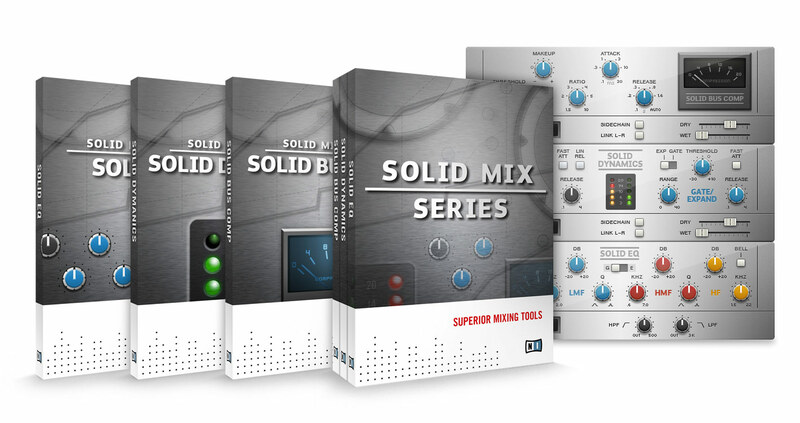 Solid Mix Series, Other software dynamics processor from Native Instruments. 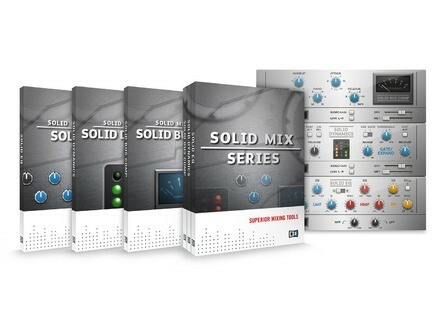 Product replaced by the Native Instruments Solid Mix Series 2013 Edition. Native Instruments announced two new products that expand its range of Guitar Rig-based studio effects: The new Solid Mix Series which emulates EQ and dynamics sections, and Transient Master, which recreates a hardware processor that provides transient processing. All products can used be used with the free Guitar Rig Player software, or expand the arsenal of the upcoming new Guitar Rig 5. Based on component modeling, the Solid Mix Series recreates the components of "a classic mixing desk whose sonic signature has shaped popular music," according to NI. The series consists of three individual modules designed to provide the tools to create éa polished and professional-sounding mix." "Solid EQ" emulates the equalizer section of the console with its 4 parametric bands as well as the adjustable low-cut and high-cut filters, which is designed to allow for especially musical and transparent sound shaping of all signal types. Switchable EQ types also offer the selection between two distinctive generations of the original hardware with their specific sound characteristics. "Solid Bus Comp" is an emulation of the bus compressor, renowned for the way that it "glues" mixes together and singlehandedly creates a "finished" studio production sound, according to the company. With Guitar Rig 5, it also provides a sidechain input as well as a dry/wet control for parallel compression. As the third component, "Solid Dynamics" provides a combined dynamics section with stereo compressor, expander and gate. Transient Master is inspired by a studio processor, and provides a method to treat drums and percussive instrument sounds by reshaping the envelope of the signal. Through the "Attack" and "Sustain" parameters of the software, Transient Master is designed to both add natural punch and definition, or blend individual instruments back into the mix. Native Instruments Studio Drummer Native Instruments announced Studio Drummer, a new instrument for the creation of acoustic drum tracks. Native Instruments Guitar Rig 5 Pro Native Instruments announced Guitar Rig 5 Pro, the next generation of its effects studio.